Thursday, October 11 7 p.m. This free wine and cheese reception is a great opportunity for OPSEU members to meet other union activists from a wide variety of workplaces in York Region. In our ongoing fight to preserve quality public services and decent public sector jobs, this is an invaluable opportunity to strengthen the bonds between the many unions active in York Region. We hope to see you there! Pension changes that we need to act on. Many of our members have defined benefit pension plans. Some members do not, and I am committed to working on their behalf to help bargain defined benefit plans. Those of us that in years past have been able to bargain and achieve defined plans, are now under attack by this government. You will find pension background campaign information in the attachment, put together by our President Brother Smokey Thomas; Sister Nancy Pridham, Regional Vice President Region 5; Mike Grimaldi, Regional Vice President, Region 2; and our very capable staff. Please read it. Our pensions are our deferred wages! · McGuinty and Duncan want to create a “superfund” with our pension money that the Government can draw on to fund private/public partnerships. 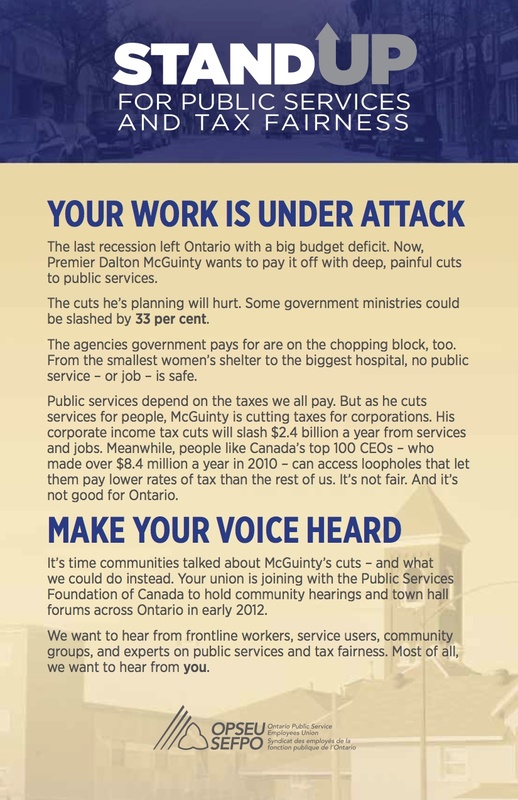 · McGuinty and Duncan want to turn our defined benefit plans into defined contribution plans. You will never know how much you will receive once retired. · McGuinty and Duncan do not like that we have joint trusteed plans; they want professional managers. We see those same bankers being charged almost every day of the week with illegal activities and conflict of interests. Our trustees come from the membership, have served us well, and work for us by hiring (and firing) the needed expertise. · Our plans are well funded. None are in trouble. McGuinty and Duncan are creating a crisis. · I put 11% of my gross pay into my pension plan and have been contributing for 25 years. God help them if they muck with my plan! Sisters and Brothers, I am asking that you phone, email, ring the door bell of your local MPP now. The next meeting of our OPSEU Executive Board Pension Liaison Committee and the Government is set for July 26th. We need to act now!!!! Wednesday, January 18, 2012 7:00 p.m. – 9:00 p.m.
To find out more about the Commission on Quality Public Services and Tax Fairness, visit www.standupontario.org. If you cannot attend a public meeting, you can still get involved by making a written submission or by joining the conversation online. Check the website for details.